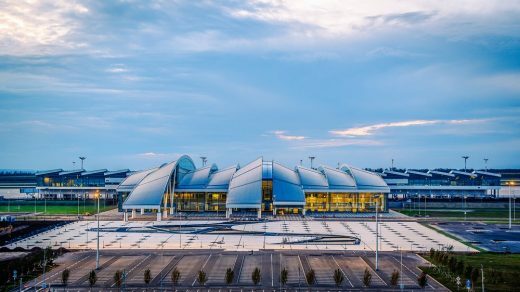 The Airport connects Gelendzhik, considered the third most popular Black Sea resort city in Russia, to eleven domestic destinations, including Moscow, St. Petersburg, Kazan and Yekaterinburg. 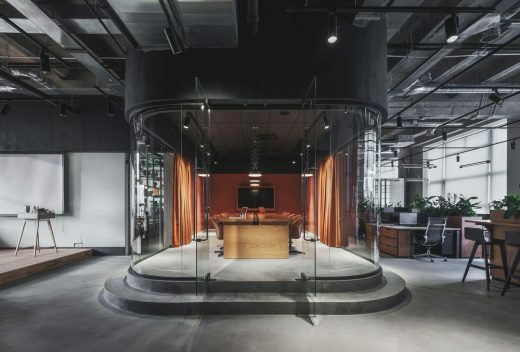 The office for IT department of the PETSHOP company is located on Chkalovsky avenue, in a Soviet-era industrial building. 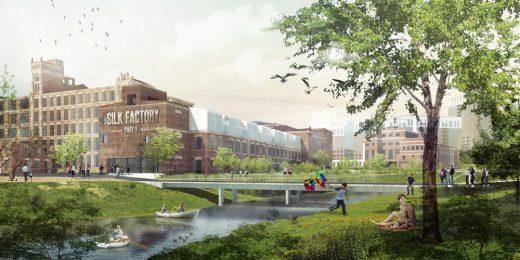 A grand innovative plan to transform the site of the former Silk Factory in Naro-Fominsk, a city two hours driving from Moscow, into a lively area. JSC ITMO Highpark has announced the contest for an architectural and planning solution the so-named innovation center with a university campus on the territory of Yuzhny satellite-city Project in Pushkin District of St.Petersburg, Russia. Applications are open. The finish date on the 1st of October, 2018.
and The Contest for an Architectural and Planning Solution has been announced. The Minister for Digital Development, Connection and Public Communications of the RF, Konstantin Noskov, has announced a new stage of ITMO Highpark Project realization represented by the establishment of an innovation center with a university campus on the territory of Yuzhny satellite-city Project in Pushkin District of St.Petersburg, Russia. It is projected that an additional University campus and innovation center with progressive industries cluster will be allocated on the territory with an area of apprx. 100 ha specified for ITMO Highpark construction within the Yuzhny Satellite – city. The Total budget of this state project financing is estimated at 41 bln.rubles. “One of the most important ITMO Highpark tasks is to develop an IT–branch as the basis for the country’s digital economics development. Furthermore, the Project is an effort to solve the general problem of staff shortage within the IT-sphere. This Innovation Center will be working for the interests of IT-sphere employers and involve them in the teaching process in order to train their workforce on the needed technologies”. This desired goal was described in a speech by Minister Noskov. On this new stage JSC ITMO Highpark has announced a contest for an architectural and planning solution. The starting date for applications was announced on 4th of September, 2018, with the last date for application acceptance as the 1st of October, 2018. The price of the architectural project contract is estimated at 63 mln rubles ($0.9 mln dollars on 5th of September rates). The contest participants have to elaborate a Master-plan of ITMO Highpark Innovation Center territory with an architectural image and inside space of its basic buildings, to form a transport and pedestrian carcass and recreational zones as well as to integrate the project into the projected construction of adjacent territories. The main educational building of ITMO Highpark should be at the center of this architectural project. It must accommodate auditoriums and lecture venues, spacious conference-hall, library and coworking, laboratories, museum complex, recreational and discussion zones, etc. Furhermore, the plans should include several scientific centers with laboratories, student dormitories and a sport complex. The area of all campus buildings is 103,600 sq.m. Vehicle traffic is projected to be highly restricted. Plans must include special bicycle lanes and placement of lanes for electronic cars traffic, creating covered recreational zones and active sports grounds. The plan should keep in mind the intended campus population of 3,600 master students and aspirants, 400 teachers, 1,100 operating and auxiliary personnel should be accommodate there. Approximately 2,500 thousands of these aforementioned peolle will live at the campus territory. Adjacent to campus ITMO Highpark Innovation center with an area of 40 ha is projected to divide into 2-8 ha land plots. All lots will be provided with utilities systems and roads. Later on the land plots will be sold or rented by residents with personal manufactures or laboratories or office buildings allocation. Furthermore the Innovation center will accommodate the National Center for Urban Studies and a Business Incubator. The overall area of Innovation Center buildings will apprx.consist in 160,400 sq.m. More than 5,100 employees and clients may work or study there. The planned completion date for all previously mentioned objectives is 2020. After that the plan is to start the gradual construction of engineering and transport infrastructure, as well as the campus and Innovation Center building, with the completion target of 2027. “We are creating an eco-system of harmonized co-existing of science and business for the purpose of introducing Russian innovative elaborations to the international market”, – emphasized Sergey Khmelevsky, CEO of ITMO Highpark, -“ Thus we should create a comfortable living environment and one which fosters scientific and business creativity”. “Full technical assignment for ITMO Highpark architectural and planning solution elaboration is posted on the United Informational Portal in Procurement Processes”, – as Anna Kolesnikova, ITMO Highpark CEO Deputy, added. ITMO University (St.Petersburg) is a national research University, a leading higher educational establishment of the RF in the sphere of informational and photonic technologies, a cradle for winners of international programming contests: ACM ICPC (a world unique sevenfold winners), Google Code Jam, Facebook Hacker Cup, Yandex.Algoritm, Russian Code Cup, Topcoder Open and etc. Priority directions are: IT, photonics, robotechnics, quantum communications, translational medicine, urban studies, Art&Science, Science Communication. Since 2013 the University is a 5-100 Project member. In 2016 the university was ranked 56th among the best World IT-Universities according to subject rating Times Higher Education (“Computer Science” discipline) and the 3d among the Russian universities in a common rating THE, as well as it was ranked 27th in the regional rating THE among BRICS states group and emerging economics countries. ITMO Highpark Innovation Centers is projected to be constructed on Yuzhny Satellite-city Project territory in Pushkin district of St.Petersburg. On the area of no less than 350 thous.sq.m. 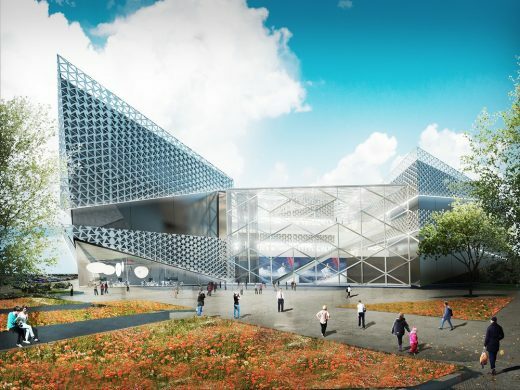 it is planned to establish a new campus of ITMO University, one of the leading St.Petersburg Universities, Business Incubators and progressive industries scientific centers, students dormitories, teachers residential objects, University master and postgraduate education objects orientated for applied research. By 2027 3,6 thousands people will be educated at ITMO Highpark, 12 thousands working places will be created as well as five innovative industries and around 50 international laboratories. “Innograd” will specialize in applied research and elaborations in the sphere of artificial intelligence and cyberphysics systems, photonics and quantum technologies, urban studies, etc. 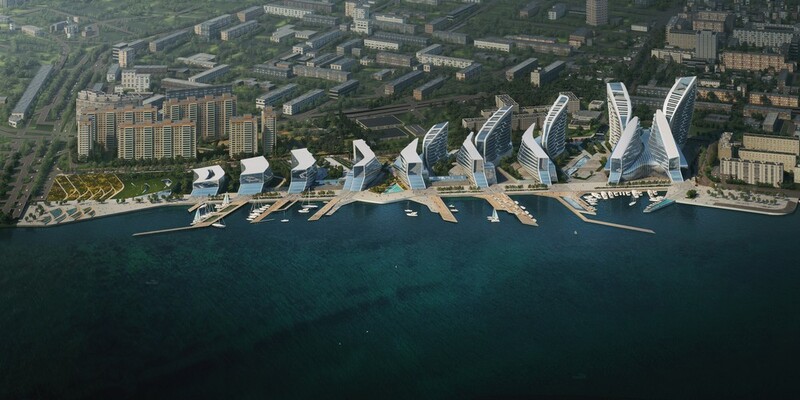 The total financing budget of the Project is estimated at 41 bln. rubles. Yuzhny Satellite-city is a new district of St.Petersburg, where it is planned to create a comfortable urban environment and new centers of attraction and development of the city and region. ITMO Highpark will be located here (apprx. 100 hectares) as a collaboration project of the Government of the RF, St.Petersburg Government, Yuzhny Satellite- city Company and ITMO University. – ExpoForum congress and exhibition center are 12 km away. Yuzhny Satellite-city is a strategic project of St.Petersburg and included in the list of priority projects of the RF. The construction of the Satellite-city should begin in 2018 and will last for 15 years. 4.3 million sq. m. of housing for 134 thousand people will be located in Yuzhny Satellite-city. The area of commercial real estate will be more than 1 million sq. m. Furthermore more than 60 thousand jobs will be created in the new district. The total investment in the project consists in 219 billion rubles. The name of the Siberian town Divnogorsk located 35 km from Krasnoyarsk appeared from a word combination “divnye gory” meaning “amazing mountains”. And indeed the panoramic view from the riverfront captures the imagination. Part of Curatorial Project’s Intercontinental program. Curatorial Project is a 501(c)(3) not for profit organization based in New York City. 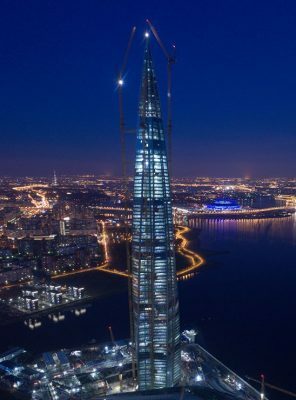 Located on the Black Sea coast, connecting Russia with the Mediterranean, Atlantic Ocean and Suez Canal, the city of Novorossiysk is the nation’s largest shipping port and the third busiest in Europe by turnover. With direct links to Russia’s rail and highway networks, Novorossiysk has also developed into an important centre of industry. 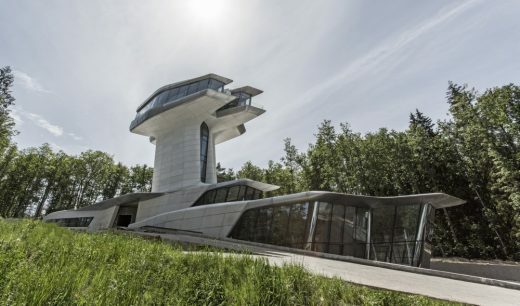 Located on the north-facing hillside within the Barvikha Forest near Moscow, where pine and birch trees grow up to 20m high, the Capital Hill Residence is divided into two main components. The first merges with the sloping forested landscape, while a separate volume ‘floats’ 22 metres above the ground to benefit from the spectacular views of the forest over the trees. 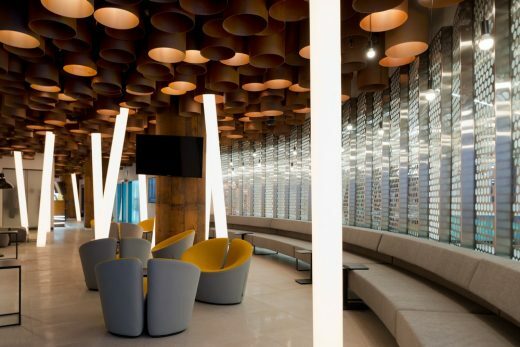 Construction of a new passenger terminal at Strigino International Airport was completed in 2016, and Nefa Architects designed a business lounge. The challenge was to create a modern comfortable space for business-class passengers using domestic airlines. 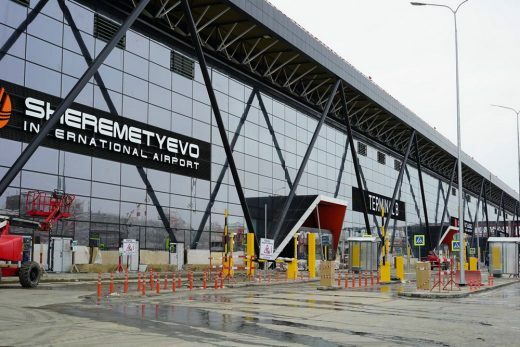 The London-based architecture office secure this contract following the announcement that Airports of the Regions, part of the Renova Group one of Russia’s leading private business conglomerates, has agreed with Yamelo Nenets Regional Government a concession to redevelop and operate the Airport. 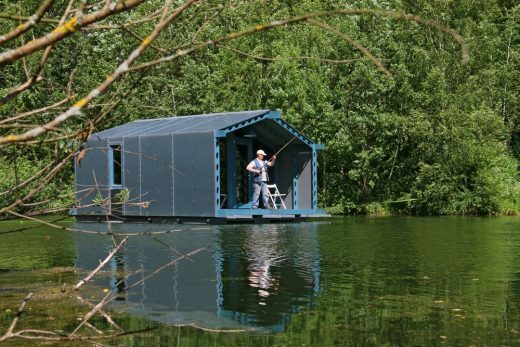 The architects are the British firm, RMJM. The concept is developed by the Serbian representative office of the bureau, with the assistance of an Italian firm. 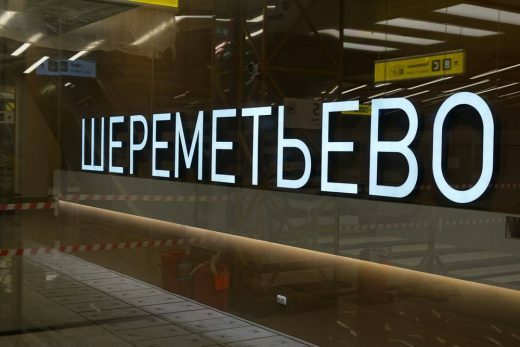 The architectural planning solution and interior design of the new terminal “B” of Sheremetyevo Airport is executed in the style of Russian Constructivism. The construction area totals 55,900 sqm of public zone. The authors of the project derived inspiration from works of master constructivists – Vladimir Tatlin, Alexander Vesnin, Alexander Rodchenko, Nahum Gabo, Lazar Lissitsky and Lyubov Popova. 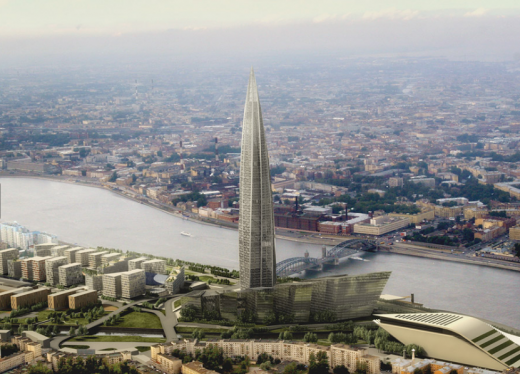 The architectural concept had to reflect “tradition, force and progress which characterize modern Russia”. 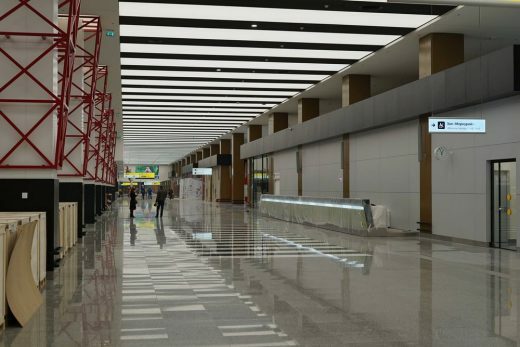 The client wanted the new B terminal to become “an exit to the world” through which Russia can tell the story, – im opinion of Goran Nikolic, the head of the Serbian office of RMJM and the chief architect of the project. The concept, – continues the architect, – focuses attention on feelings of national pride, inherent in Russians. This feeling and openness are turned to the guests arriving to the country. In turn, it has to be clear to foreigners that the ideas created in Russia are so big, ‘as the Russian land’. The principles of Constructivist art and architecture are used in the logic of the functional organization of space, in a decor and also in geometricity of registration of a floor covering, columns, walls and ceilings. 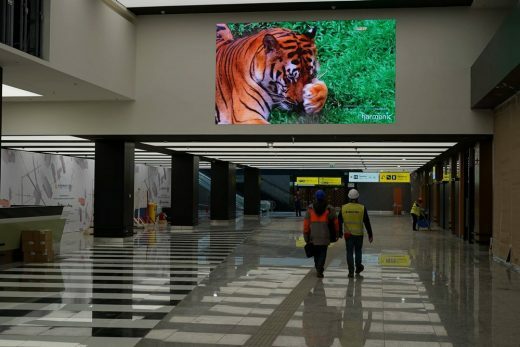 “Live” digital-panels — large-format displays which broadcast the main images of Russia became bright accent in interiors: beauty of the nature, tourist sights, monuments of the Russian culture, ballet statements. 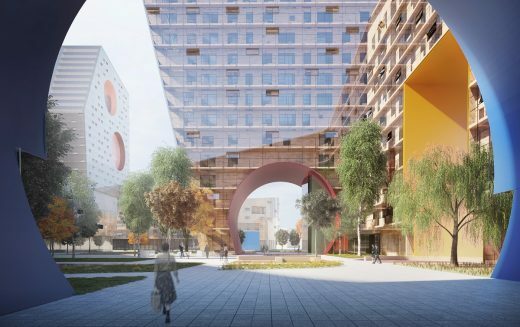 The US architecture firm in collaboration with Art-group “Kamen” beat Fuksas Architecture, Zaha Hadid Architects, Mad Global, and Tsimalo, Lyashenko & Partners to win the international design competition for the residential quarters of the Tushino district. 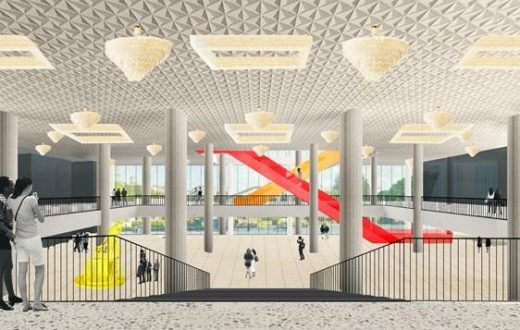 OMA’s renovation plans of the New Tretyakov Gallery on Krymsky Val have been unveiled. Reserve will collaborate on the project as a local partner. 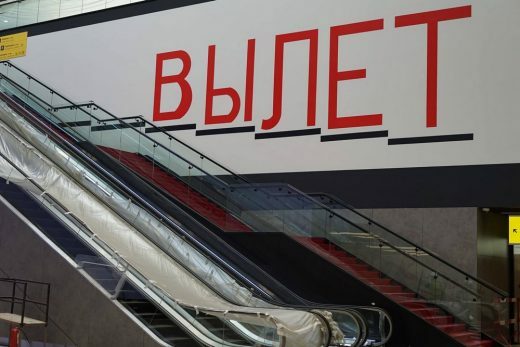 The New Tretyakov houses an extensive and important collection of Russian art, including seminal work from Malevich, Kandinsky, Chagall, and Soviet artists such as Aleksandr Deyneka and Vera Mukhina. Europe’s tallest tower has topped out at 87 storeys. 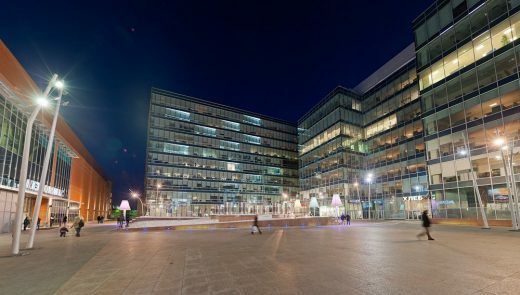 The controversial 330,000 sqm development was previously known as the Gazprom Group Headquarters and Business Centre. The skyscraper building is located on a 17-hectare brownfield site. The building uses the largest volume of glass ever used on a high-rise building. 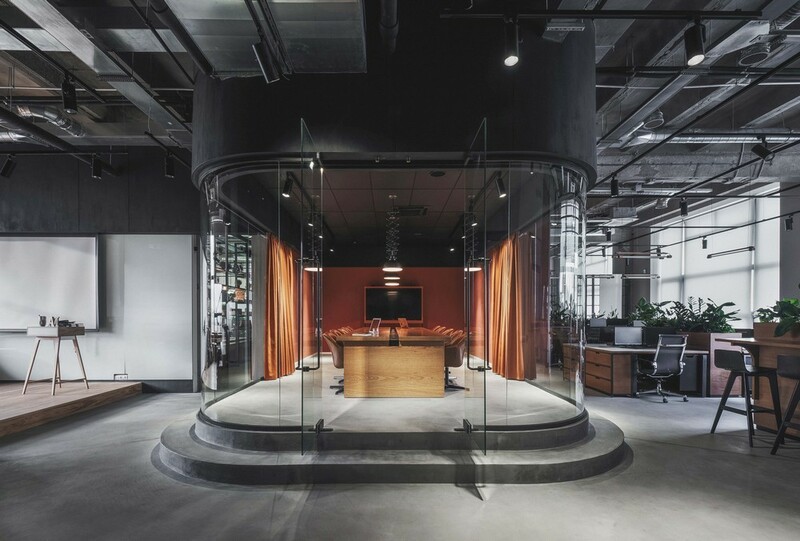 Emerging London practice, Twelve Architects has completed a new airport in Rostov on Don, Russia. 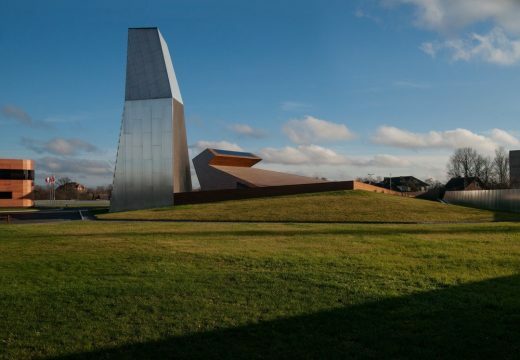 The £600 million project is the practice’s largest commission to date as it celebrates its fifth year of operation. 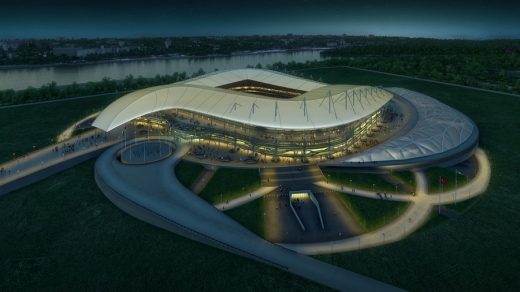 Populous, architects of the London 2012 Olympic stadium, Sochi 2014 Olympic stadium and Soccer City 2010 World Cup stadium, have been selected as designers of the new Rostov Stadium. 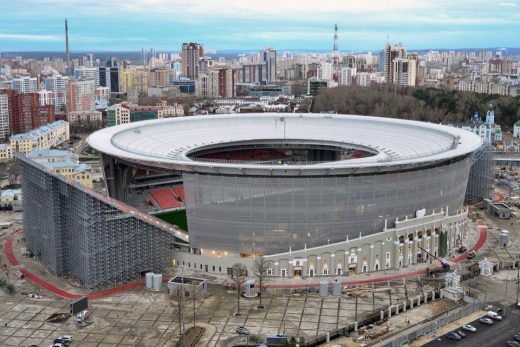 This will be the fourth stadium designed by Populous in Russia to be used for the 2018 World Cup. This complex is located in an old German town which was severely damaged during the Second World War. The modern brandy distillery was built on an empty lot next to a railroad. The mandate was to build a warehouse, which apart from its primary function of storing brandy barrels would serve as a public space and reception hall. 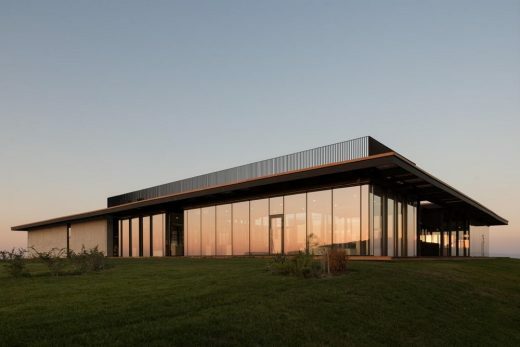 The Gai-Kodzor Winery (Russia, Krasnodarsky Krai) has been completed. General Designer of the building is the architecture bureau Kleinewelt Architekten. The 1,500 sq.m. 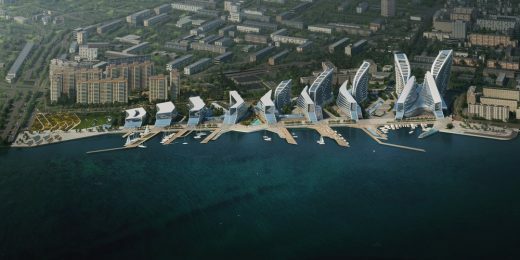 multifunctional complex is located halfway between Anapa and Novorossiysk, the sunniest spot of Russia just 5 km away from the sea. Apart from being a production facility, the project is to combine museum, education, hospitality and entertainment functions. 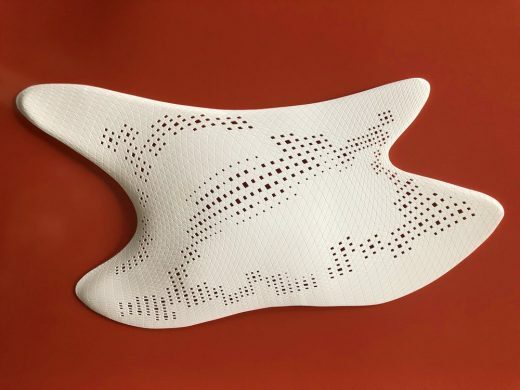 The prototype was designed and made as a tourist equipment where the weight of every detail is taken into account so it can be used in very harsh conditions. All the constructive elements were subject to change as well as the interior finishing compared to the regular houses. 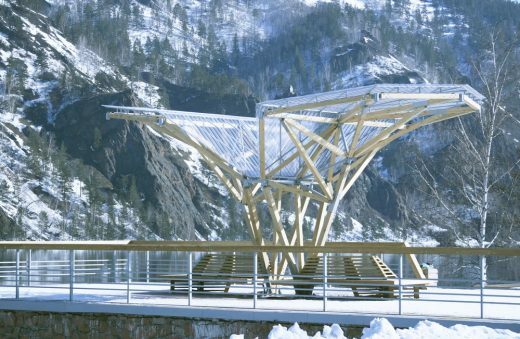 The frame is made of laminated wood with a milled ports. National Research Moscow State University of Civil Engineering (MGSU) and the Russian Green Building Council (RuGBC) announce the launch of a partnership with BRE, the world leading multi-disciplinary building science centre. It aims to drive sustainable best practice through knowledge share and the development of BREEAM. 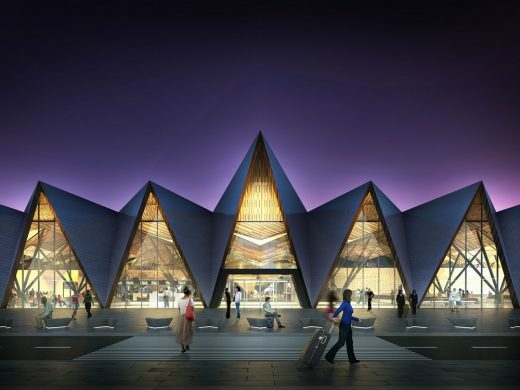 London-based practice Twelve Architects has been granted unanimous approval from the City Administration of Ekaterinburg for a 120,000 sqm retail mall, which forms a key part of the regeneration and expansion of the city.